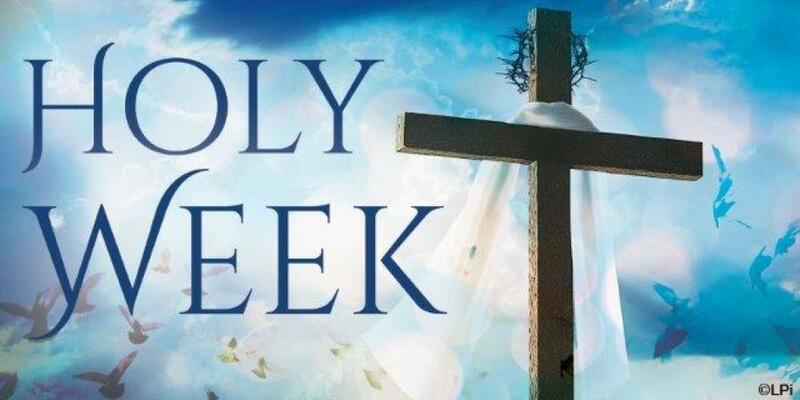 All are invited to join us for Holy Week services at St. Patrick Church--the days that the Roman Catholic Church observes the annual festival of the Passion, Death, and Resurrection of Jesus. The Triduum (pronounced trid oo um), the three days from Holy Thursday evening through Easter Sunday, is the high point of the entire Church year. At St. Patrick, these are the days for our most moving and beautiful rituals, stirring music, and the finest decor. If you are unable to be with us for all or some of the Triduum liturgies, make an extra special effort to set these holy days aside with time for personal and family prayer. Herein is a description of the Holy Week liturgies as they will be celebrated at St. Patrick Church this year. On Palm Sunday, we enter Holy Week, the time when we remember Christ’s passage from death to life, with a commemoration of the Lord’s triumphal entrance into Jerusalem. Carrying palm branches and shouting “hosannas” we acclaim Jesus Christ as our King. Once everyone has gathered inside the church, the tone of the liturgy suddenly changes as we remember that our Lord suffered and died to save us. The high point of the Palm Sunday liturgy is the proclamation of the Passion from the Gospel of Luke. On Palm Sunday we will celebrate our regular Sunday Mass schedule. At the 9:30 a.m. Mass on Sunday, the liturgy begins in the courtyard with the blessing of palms and procession into the church using the main entrance. Tenebrae Service: April 14, 2019 at 7:00 p.m.
On Palm Sunday evening, we gather in silence for a very solemn candlelit service. The word tenebrae is Latin for shadows. This service recreates the betrayal, abandonment, and agony of the events of the last hours of the life of Jesus. We listen to the gospel readings and then hear a reflection by some of the major characters in the life of Jesus. Quiet music helps us to reflect further on the love of Jesus for all of us. We all depart in silence. Holy Thursday: Mass of the Lord's Supper April 18, 2019 at 7:00 p.m. Adoration continues in the chapel until 11p.m. Lent ends at sundown on Holy Thursday. Tonight we begin the three-day celebration which is the summit of our liturgical year. Everything that takes place from sundown on Holy Thursday to sundown on Easter Sunday is part of one great celebration played out in three movements. In this annual three-day festival, we commemorate Christ’s passage from death to life. All the baptized keep these three days in a spirit of prayer and fasting as we remember our passage from death to eternal life. At 7:00 p.m., the Mass on Holy Thursday begins with the ringing of bells and singing of the Gloria--a sign that Lent has concluded and the Triduum (three-day festival) has begun. After listening to sacred scripture, we do something strange--we wash feet. Jesus washed his disciples’ feet at the Last Supper. Tonight Father Michael washes the feet of members of our own community. They take our place in this act of total humility. The high point of Thursday’s service is the celebration of the Eucharist. With the breaking of unleavened bread and sharing of a common cup, we remember the death of our Lord. After communion, the Body of Christ, reserved for services on Good Friday, is carried into the chapel. For three days the Blessed Sacrament is not present in the main church as a symbol of Jesus in the tomb for three days. The liturgy of Holy Thursday has no end. In the spirit of Gethsemane we continue to watch and pray in silence. Adoration of the Blessed Sacrament continues in the chapel until 11:00 p.m. Please join us there in prayer for a while. On Good Friday, the People of God continue to keep watch in prayer and fasting. We fast and abstain from eating meat today (if possible we continue the fast throughout Holy Saturday) in anticipation of the Eucharistic feast that we share on Easter. The church remains open all day today for visitation and private prayer. At 3:00 p.m., we will gather quietly to listen to the proclamation of the Lord’s Passion as told to us by John. After sharing the Word of God, the community prays at length for the needs of the world. The Holy Cross is raised triumphantly for all to see and venerate. One by one we come forward to touch, embrace, or kiss the wood of the cross. We reverence the Holy Cross with a bow or genuflection. On Holy Saturday, the community continues to quietly keep vigil in fasting and prayer. God rested on the seventh day of creation. On the seventh day Christ rested in the tomb. Today we also rest, preparing for the evening celebration. Please also note that the Vigil is held at a later time, 8:00 p.m. This is in keeping with the Church’s tradition of celebrating the Light Service of the Vigil in total darkness and is mandated by Bishop Duca for the celebration of the Easter vigil throughout our entire diocese. The Solemn Easter Vigil begins with the lighting of the new fire in the courtyard. We then carry the paschal candle into the darkened church and, while spreading the light to all who are gathered, we proclaim once again that Christ is the Light of the World. The Vigil continues with the proclamation of many of the most powerful scriptures in the Bible. The Service of the Word concludes with the singing of the Easter Alleluias and the proclamation of the gospel account of Jesus’ resurrection. After invoking the intercession of the Saints, we process to the font and bless water for Baptisms that will take place during the Easter season. After remembering our own Baptism, the whole assembly, united in our common faith, celebrates the Easter Eucharist. We welcome to the table for the first time those who have professed their faith and received the Sacrament of Confirmation at this celebration. How blessed are we to celebrate with them their full initiation into the Catholic Church through the community of St. Patrick. In this Vigil we remember Christ’s victory over death. In a powerful way we also celebrate our creation, our passage from slavery to freedom, as well as our victory over sin and death. Easter Sunday: April 21, 2019 Masses at 7:30, 9:30 and 11:30 a.m.
On Easter Sunday, April 21, 2019, we begin the Fifty Days of rejoicing that lead to the Feast of Pentecost. Flowers fill the church; uplifting is our jubilant song. The Alleluia is one again sung and holy water flows generously from the font. During this time of the church year we will celebrate many important events in the life of our community: Baptism, First Eucharist, and Marriage.